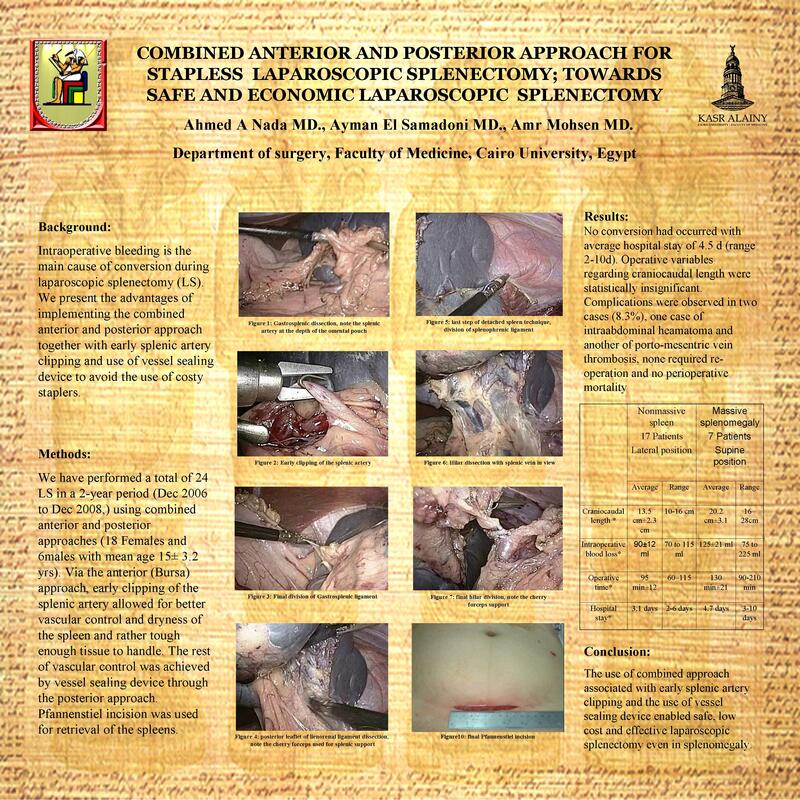 Background: Intraoperative bleeding is the main cause of conversion during laparoscopic splenectomy (LS). We present the advantages of implementing the combined anterior and posterior approach together with early splenic artery clipping and use of vessel sealing device to avoid the use of costy staplers. Methods:We have performed a total of 24LS in a 2-year period using combined anterior and posterior approaches (18 Females and 6males with mean age 15± 3.2 yrs). The widest splenic diameter dictated the operative position and the port locations where in group I (≤ 16 cm) the lateral position with 4 subcostal trocars and in Group II (> 16 cm) the supine position is used with different locations for the 4 trocars. Via the anterior (Bursa) approach, early clipping of the splenic artery allowed for better vascular control and dryness of the spleen and rather tough enough tissue to handle. The rest of vascular control was achieved by vessel sealing device through the posterior approach. Pfannenstiel incision was used for retrieval of large spleens and those needed for pathology . Results:our indications for splenectomy included (ITP in 13, spherocytosis in 5, Thalassemia and immune hemolytic anemias 3 cases each). All cases of LS were completed with no conversion. The average widest splenic diameter in group I (15 LS) was 13.5 cm (range 10–16). While in group II (9 LS); the average diameter of 20.8 cm (range 16–28). Average intraoperative blood loss in group I was 60±12 ml range from 55 to 85 ml while in group II averaged 100±21 ml ranged 75 to 145 ml. No blood transfusion was needed. The average operative time was 95 min (range 60–115) in group I while in group II it was 130 min (range 90-165). There was no perioperative mortality, with three (12.5%) postoperative complications, 2 cases with thrombosis of the spleno-portal axis treated conservatively and one case with postoperative fever due to intraabdominal heamatoma drained under ultrasonographic guidance. The average postoperative hospital stay was 3.5 days (range 3–6) in group I and 4.2 days (range 3-7) in group II. Conclusion: The use of combined approach associated with early splenic artery clipping and the use of vessel sealing device enabled safe, low cost and effective laparoscopic splenectomy even in moderate splenomegaly.